Preparation Methods & Dosage :Calendula is most often applied to the skin in creams, lotions and oils, but can be taken as an herbal tea, used as a tincture, and applied as a poultice. Make a simple homemade facial by boiling a handful of fresh petals in milk. Use the flower petals to add color to soups and rice dishes. Use just the petals, do not eat calyx or flower centers. For a sore throat or indigestion, drink calendula tea or use it to gargle, for scrapes and bruises apply the tea directly to your skin. Take the sting out of insect bites and rashes by applying the bruised, fresh flowers directly to the irritated skin. 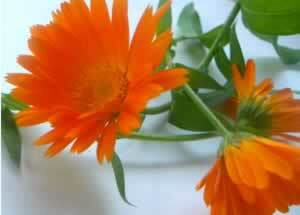 Dawson, pp199-200 Use a few drops of calendula tincture to treat sore gums and mouth ulcers. Calendula combines well with comfrey and St. John's wort for healing skin. Flowers:The flowers are the part used in herbal medicine. Calendula bears many-petaled orange or yellow flowering heads two to three inches (four to seven centimeters) in diameter. Flowering Season:Begins in June. Its name refers to its tendency to bear flowers by the calendar, once a month in warm climates, usually during the new moon. "Marigold" refers to the Virgin Mary, and marigolds are traditionally used in Catholic celebrations concerning the Virgin Mary. Distribution:Native to the Mediterranean, grown widely as a garden flower, cultivated for use in herbal medicine. 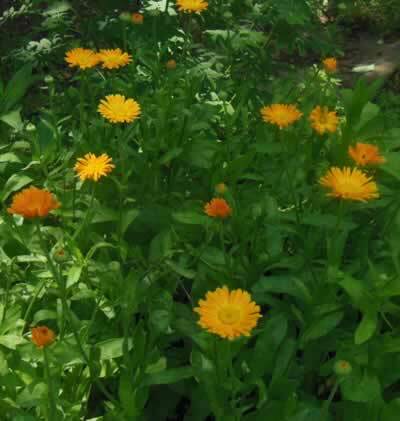 Calendula is easy to grow and is an attractive addition to your flower, vegetable, and/or herb garden. Sow seeds directly when the soil temp reaches about 60 degrees in the spring. You will be rewarded with masses of bright green foliage and sunny, yellow blooms. Harvest the flowers when they are newly opened. Pluck the petals from the dried flower heads and store in dark-colored glass jars to preserve the medicinal properties. During the American Civil War, calendula petals were used to staunch wounds. Marigolds are called after the Virgin Mary. In Macer's Herbal it is stated that only to look on Marigolds will draw evil humours out and strengthen the eyesight.